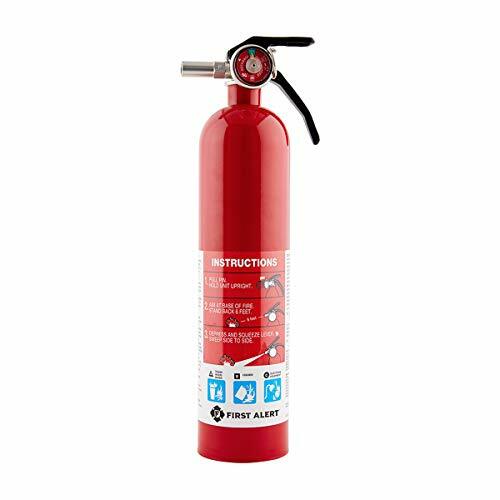 The First Alert KITCHEN5 Fire Extinguisher is UL rated 5-B:C and designed for kitchen use, fighting flammable-liquid and electrical fires. It has a durable metal head, a metal pull pin with a safety seal to help prevent accidental discharge and tampering, an easy-to-use pop-up pressure indicator, and a chemical-resistant and waterproof label with simple instructions. It comes with a decorative quick-release mounting bracket for easy kitchen installation. The First Alert Tundra Fire Extinguishing Aerosol Spray is easier to use than traditional fire extinguishers and discharges 4 times longer than regular extinguishers, making it ideal for fighting common household fires and providing 32 seconds of discharge to ensure the fire is out. The nozzle sprays a wide area, giving you greater control to put out a fire faster. Just point and spray the Fire Extinguishing Aerosol Spray on household fires consisting of paper, fabric, wood, cooking oils, electrical appliances, or equipment. 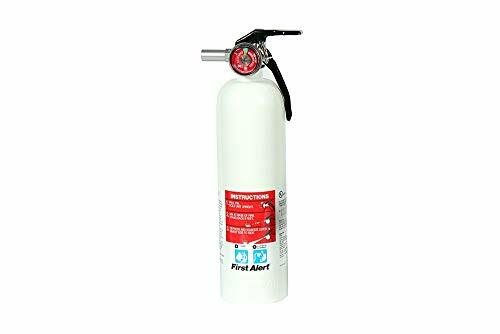 The portable extinguisher spray is ideal for the kitchen, boats, RVs, and travel, and the biodegradable, nontoxic-foam, fire-extinguishing formula wipes away with a damp cloth for easy cleanup. Won't damage appliances, equipment, or counter surfaces. View larger. One can of AF400 Tundra Fire Extinguishing Spray and manual. it's much easier to use than a traditional extinguisher. 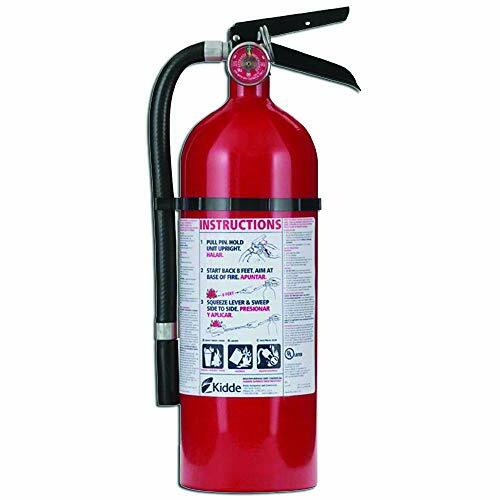 A multipurpose fire extinguisher for your home or business, the Kidde Pro 210 (model No. 21005779) is fitted with a pressure gauge that provides an at-a-glance status, and it features a lightweight aluminum cylinder and sturdy chrome-plated brass valve assembly. Features The Kidde Pro 210 is suitable for use on Class A (trash, wood, and paper), Class B (liquids and gases), and Class C (energized electrical equipment) fires. It's ideal for protecting your home as well as low-hazard occupancies such as offices, churches, assembly halls, classrooms, and hotel guest areas. This rechargeable unit contains four pounds of a multipurpose monoammonium phosphate dry chemical extinguishing agent. It has a discharge time of 13 to 15 seconds, a discharge range of 10 to 15 feet, and an operating pressure of 100 PSI. The seamless aluminum cylinder is powder coated for corrosion protection, and it measures 4.5 inches in diameter and 15.7 inches tall. Assembled in Mexico from globally sourced components, it's backed by a six-year limited warranty. It comes with a plastic hanger, and it is Coast Guard (U.S.C.G.) approved when fitted with an optional mounting bracket. What's in the Box One Kidde Pro 210 fire extinguisher, one plastic hanger, and operating instructions. 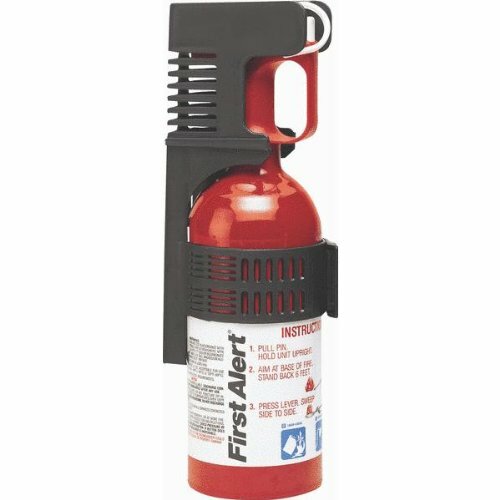 This heavy-duty, all-metal First Alert HOME2 Fire Extinguisher features a commercial-grade metal valve and trigger. It's UL rated 2-A:10-B:C and meets minimum 2-A:10-B:C code requirements for fighting wood, paper, fabric, flammable-liquid, and live electrical-equipment fires. The color-coded gauge provides accurate measurement to ensure the extinguisher is ready to use in an emergency, and the metal pull pin and safety seal help prevent accidental discharge and discourage tampering. A bracket and strap are included for secure mounting. The chemical-resistant and waterproof label features easy-to-read instructions and won't deteriorate over time. The extinguisher fits easily inside a standard fire box. 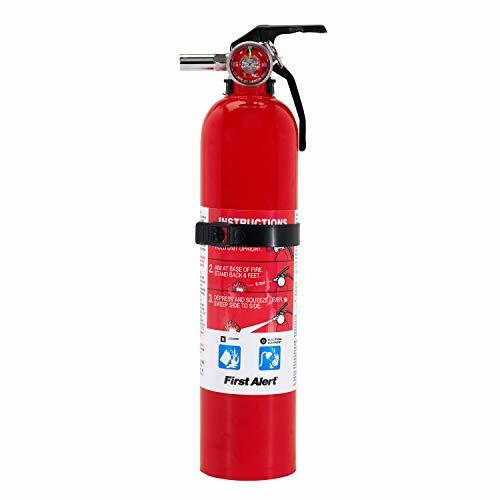 To minimize damage or injury in the event of a fire, the first step is having the right fire extinguisher on hand. 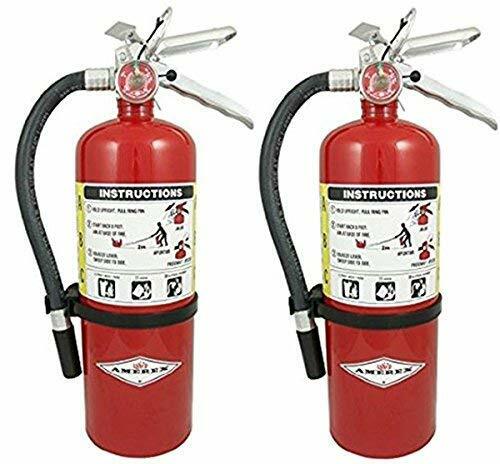 The DHOME1 fire extinguisher is ideal for use in any household location and is UL rated 1-a 10-b: c for fighting wood, paper, trash, plastics, gasoline, oil, and electrical-equipment fires. The commercial-grade metal valve and trigger ensure it's ready to use in an emergency. Once used, it can be recharged by a certified professional. It also includes a mounting bracket to keep the unit secure and within reach and is U.S. Coast guard approved for marine use. Plus, the designer Pewter color matches modern home designs. 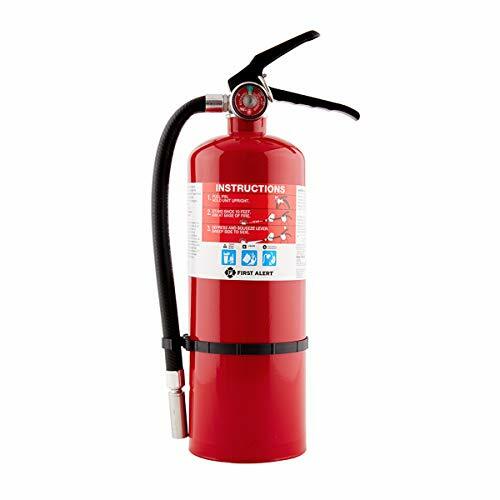 The First Alert REC5 Fire Extinguisher is UL rated 5-B:C; it's designed for marine, recreation, and home use, fighting flammable-liquid and electrical fires. It s U.S. Coast Guard approved for marine use when mounted in the included bracket. 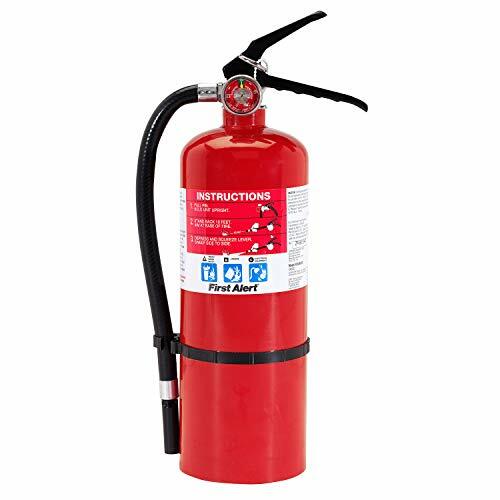 The extinguisher has a durable commercial-grade metal head, a metal pull pin with a safety seal to help prevent accidental discharge and tampering, a corrosion-resistant, color-coded metal gauge, and a chemical-resistant and waterproof label with simple instructions. Bracket and strap are included for secure placement of extinguisher, designed to meet the demanding needs of travel. 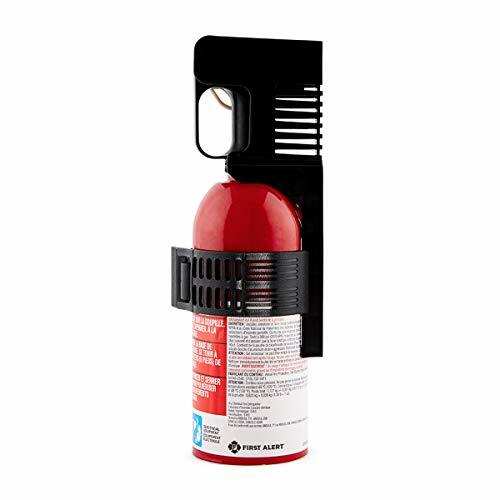 This heavy-duty First Alert PRO5 Fire Extinguisher features a commercial-grade metal valve and trigger, is UL rated 3-A: 40-B:C, and exceeds minimum 2-A:10-B:C. code requirements. It's ideal for home offices, small businesses, and light manufacturing applications, and fights wood, paper, fabric, flammable-liquid, and live electrical-equipment fires. The color-coded gauge provides accurate measurement to ensure the extinguisher is ready to use in an emergency, and the metal pull pin and safety seal help prevent accidental discharge and discourage tampering. 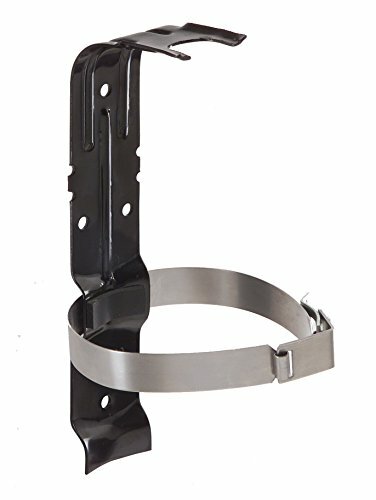 A bracket and strap are included for secure mounting. The chemical-resistant and waterproof label features easy-to-read instructions and won't deteriorate over time. The extinguisher fits easily inside a standard fire box. 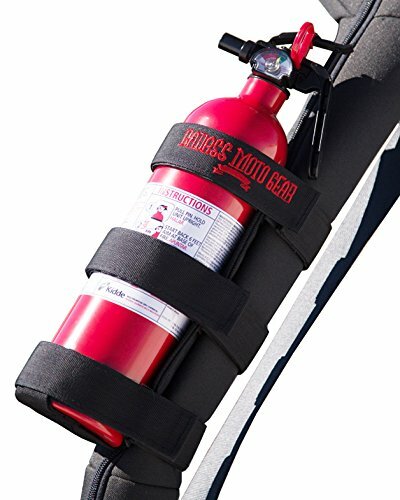 Badass Moto Gear Adjustable Roll Bar Fire Extinguisher Holder for Jeeps Durable Stitching. Easy Install. for Jeep Wrangler, Unlimited, CJ, JK, TJ, Rubicon, Sahara, Sport. Extinguisher not Included. 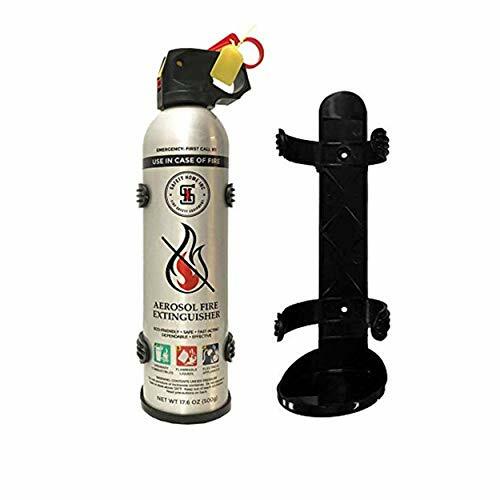 The First Alert Auto Fire Extinguisher is compact and can be stored in any car or vehicle. 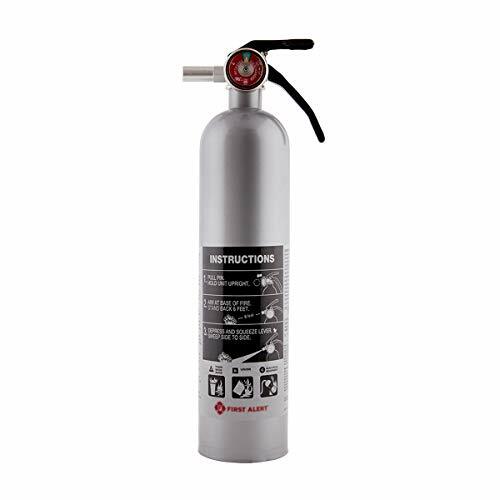 5-B:C rated compact car fire extinguishers are ideal for use in vehicles. Fights flammable liquid and electrical fires. Small enough to fit in the trunk. Includes heavy duty mounting bracket to keep unit secure. Meets UL standards. Secure extinguisher mount, bracket and strap are included for secure placement of extinguisher. Easy instructions with a chemical resistant & water proof label with 4-step instructions won t deteriorate. 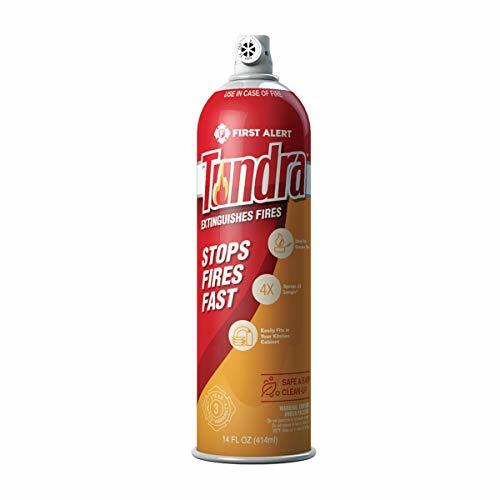 The First Alert Tundra Fire Extinguishing Aerosol Spray is easier to use than traditional fire extinguishers and discharges 4 times longer than regular extinguishers, making it ideal for fighting common household fires and providing 32 seconds of discharge to ensure the fire is out. The nozzle sprays a wide area, giving you greater control to put out a fire faster. Just point and spray the Fire Extinguishing Aerosol Spray on household fires consisting of paper, fabric, wood, cooking oils, electrical appliances, and equipment. 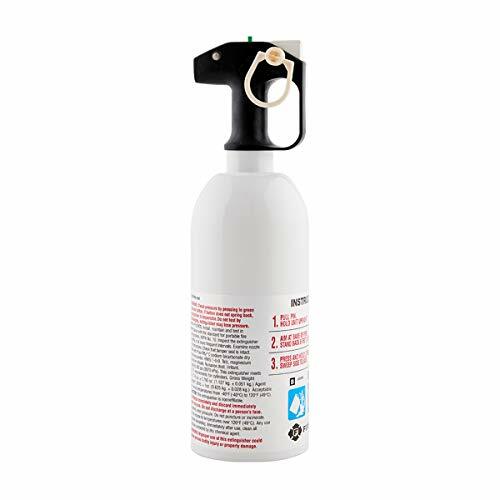 The portable extinguisher spray is ideal for the kitchen, boats, RVs, and travel, and the biodegradable, nontoxic-foam, fire-extinguishing formula wipes away with a damp cloth for easy cleanup. 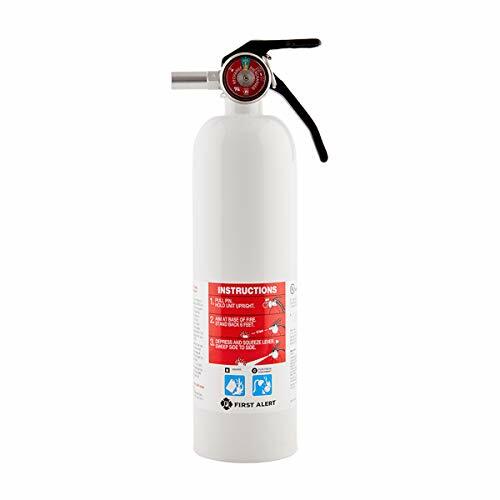 The First Alert GARAGE10 FE10GO Fire Extinguisher is UL rated 10-B:C and designed for garage and workshop use, fighting flammable-liquid and electrical fires. It has a durable metal head, a metal pull pin with a safety seal to help prevent accidental discharge and tampering, a corrosion-resistant color-coded metal gauge, and a chemical-resistant and waterproof label with simple instructions. It comes with a wall bracket for easy installation. Cardstock: High-strength, Wear-resistant and waterproof material. 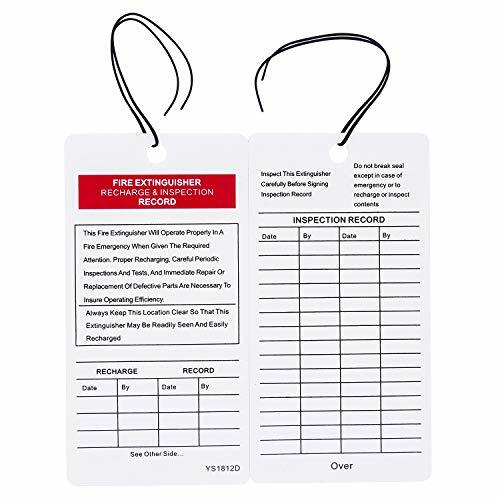 You can use fire extinguisher tags for indoor or outdoor. Package: 20 pcs /pack. Record Inspections for 30 times every tags. -One hand pull the knob out horizontally, the other hand pull the fire extinguisher vertically.It's easy and quick to release fire extinguisher. -This fire extinguisher bracket is made of aluminum alloy, not rusting, more durable. 1. 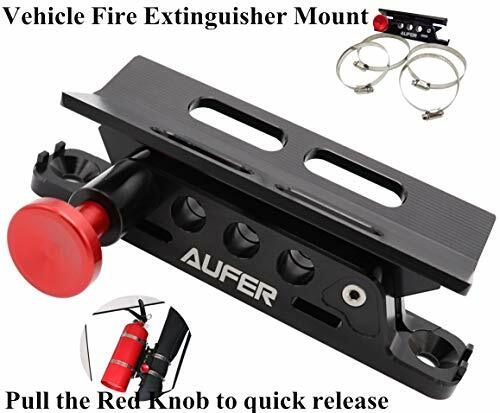 Attach the fire extinguisher bracket to the roll rack by adjustable rings,no drilling.The fire extinguisher bracket has four protruding iron beads to prevent the fire extinguisher from falling off. 2. Various installation methods are suitable for many vehicles.Such as Jeep Wrangler Unlimited TJ JK JL Rubicon Sahara Sport and Polaris RZR Ranger 700 800 900 1000 XP Turbo.It Can support 2-2.5 LBS extinguishers. 1. Release Qucik. One hand pull the Red knob out horizontally, the other hand pull the fire extinguisher vertically. It's easy and quick to release fire extinguisher. 5. 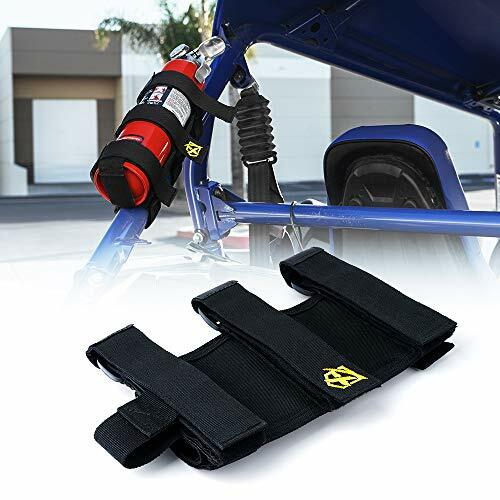 Package Includes 1x mount (base and separable holder) and 4 straps (two for holding bottle/fire extinguisher and the rest for mounting the device onto your roll bar). Any question feel free to E-mail us. We will try our best to provide you with satisfatory solution. NOTE Fire extinguisher not included. QUICK RELEASE to easily get your fire extinguisher out when needed. One hand pull the knob out horizontally, the other hand pull the fire extinguisher vertically. It's easy and quick. HIGH QUALITY-This fire extinguisher bracket is made of aluminum alloy, not rusting, more durable. 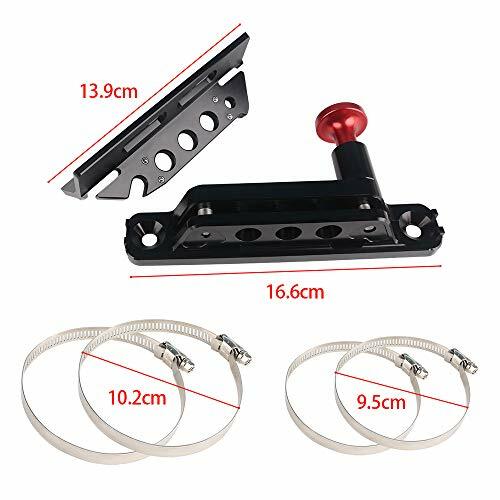 EASY TO INSTALL: The vehicle Fire Extinguisher Bracket securely clamps onto the front or rear of the seat rails by adjustable rings, or bolts onto seat mount points, no drilling. The fire extinguisher bracket has four protruding iron beads to prevent the fire extinguisher from falling off. - VARIOUS INSTALLATION methods are suitable for many vehicles. Such as Jeep Wrangler Unlimited TJ JK JL Rubicon Sahara Sport and Polaris RZR Ranger 700 800 900 1000 XP Turbo. It Can support 2-2.5 LBS extinguishers. MATERIAL - Made of Tough Thick Nylon, Durable and Reliable , Heavy Duty Hook and Loop Straps. ADJUSTABLE - Fit 2-3 Padded Or Unpadded Roll bars, Holds up to a 3lb Fire Extinguisher. Fit Any vehicle with 1 Rollbars. EASY INSTALLATION - No-Slip Lining, Secure Tight Fit. The Safety Home Story In recent years, fires have been increasing in frequency. Whether it's a wildfire in California, or a home fire in N.Y., lives are being destroyed and families remain in trauma. Having, unfortunately, experienced watching families we know personally, suffer loss because of home fires, we have decided to become proactive. After diligent research and development, we have partnered with respected manufacturers in order to bring a line of high quality specialty products to the consumer. Making Fire Safety Manageable After intensive research into how and why fires and household disaster occur, we realized that the problem was not just in preventing major accidents, it was that far too many people did not have the tools and understanding of how to mitigate damage. We realized that to save more lives, we needed to make it easier to stop small mishaps from becoming life-threatening scenarios. That is when we turned our focus to identifying the most common root causes of major household accidents and designing products that could head them off at the pass. We knew these products needed to be simple to use, safe for anyone to handle, and unflinchingly reliable every single time. At Safety Home, we're not here to sell you a product, we're here to help you keep your family safe and secure. We created these products to keep our community safe, and we want you to do the same. Explore our home safety products now or contact our team to discuss your unique home safety needs. We want to be your ally in protecting the things that matter most to you. HOW TO USE - 1 - Pull and remove red safety latch. 2 - Hold can 3-5 feet from fire. 3 - Spray across base of fire in a sweeping motion. IMPORTANT: DO NOT ATTEMPT TO FIGHT LARGE FIRES THAT ARE TOO DIFFICULT TO FIGHT FROM 3-5 FEET AWAY. USE THIS FIRE EXTINGUISHER FOR SMALL FIRES ONLY. ANTI SMOKE MASK - Designed for a single use application and cannot be reused. Suitable for applications in homes, hotels, offices and all other smoke polluted areas, as an essential breathing protective device for personal safety in emergencies. Must be kept in a well-ventilated place free of heat sources, flammables, explosives and corrosive materials. Must be protected from rain and moisture. DO NOT USE IF VACUUM AIR TIGHT BAG IS RIPPED OR BROKEN.